All of the books from Falvey’s second floor have been successfully relocated to Old Falvey with room to spare. The next phase involves the electrical upgrades in Old Falvey that are required for the installation of a public address system, doors that release automatically when the fire alarm system is triggered, and new light fixtures that respond to movement. We don’t yet have a firm completion date for this work. Book stacks, now completely empty, are being disassembled on the second floor of Falvey Library and heavier construction is due to begin in the next week or two. We will keep you informed of our progress on that front. 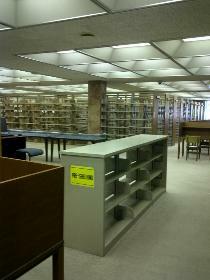 Library staff will continue to page main stacks materials in the A – DZ call number ranges from the Old Falvey Annex. Please contact us at the service desk for assistance at 610-519-4270 or by sending an email to circ@villanova.edu. As always, patrons can also place a hold in the catalog for a particular title, prompting staff to retrieve it and hold it at the front desk.